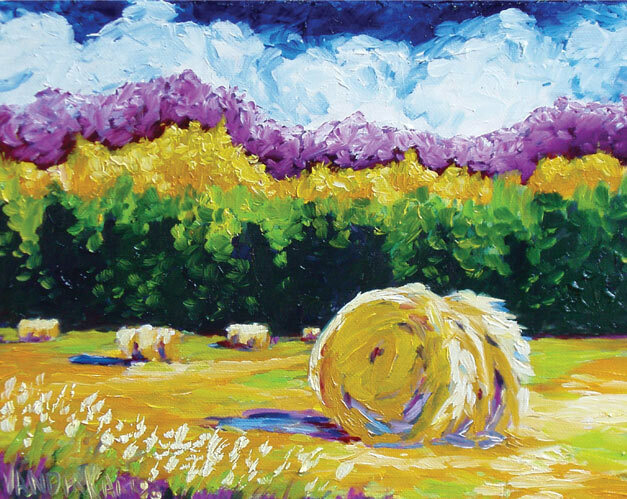 “Bringing in the Hay” is based on familiar scenes of summer hayfields. Walking into Lisa VanDerKarr’s studio is like walking into a sunny day. The senses are greeted by romantic vineyards, windswept seasides, charming gardens and bold swaths of color that chase the gray away. “Sometimes when I need to lift my spirits, I’ll just come in here and surround myself with my paintings; it always brightens my mood,” she said. Other people find their way into her studio for the same reason and inevitably leave feeling lighter. “Night Sailing” is reminiscent of sailing on Lake Pend Oreille. One could speculate that there is a reason that VanDerKarr’s paintings are so joyful – she is making a living doing something she loves. “I’ve been lucky or something, because things have been good to me,” said VanDerKarr of her life and career. But it’s more than just luck. She is a driven businesswoman: “It’s easy to make a living at this; you just have to take care of business.” She says that she spends only half of her time painting, the rest of her time goes to the commercial side of things: the maintenance of her Web site www.lisavanderkarr.com; shipments of artwork for people who live out of town; and pursuing lucrative venues, such as galleries in Southern California or magazine covers. “Magazine covers are a great source of publicity. The first one I ever did (Vine Times, in 2004) reached a half a million people. It got some attention,” she said. Indeed it has. 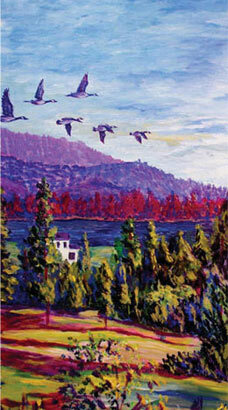 VanDerKarr now sells about 50 paintings a year. “The art really sells itself; people get attached to the images, images that make them feel something, and that’s it. They have to have it,” she said. In the end though, VanDerKarr’s true talents lie in her brushstrokes. She spends the winters devoted to painting in her studio above Cabin Fever overlooking Cedar Street, where she gets great light, especially after a fresh snowfall. “When I start painting, I just approach the whole day as if I’m free from time. It makes the resulting art more open, more creative,” she said. She has been living in Sandpoint for 15 years with her husband and three children. The light of the newly fallen snow isn’t the only inspiration she finds in the small town. “Every little bit of Sandpoint is just so beautiful. All you have to do is stop and look around,” she said. She paints with oils, a medium she loves for the texture and bold color – and the fact that the brushstrokes often have a mind of their own. Sometimes when she paints something a few times, it will start to appear more and more. “If something really wants to be in a painting, it will just show up. I can try to redirect it, but usually I just have to go with the flow, and it will work out,” she said. show up. I can try to redirect it, but usually I just have to go with the flow, and it will work out,” she said. VanDerKarr begins with photographs she has taken of images she wants to paint and then lays down a water base – sometimes spending weeks getting the composition just right – before she starts layering on the oils. This process allows her lots of freedom to play with the colors and finer details. Her use of light is especially moving, casting an unusual glow over each piece. 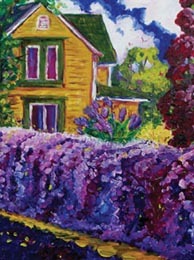 Her portraits of Sandpoint seem to take place mainly in people’s summer gardens and over brisk fall landscapes. Their brilliant colors and composition capture not just the essence of the town, but of something outside of it as well. There is worldliness in each painting, which leaves the interpretation of the location to the beholder. “People will ask if a certain piece is from a certain place, and I say, ‘Yes, it is wherever you want it to be,’ ” she said. It is no coincidence that her paintings have a California feel to them; she grew up with her big family at Butterfly Creek Winery in the Sierra Nevada foothills. She still visits her brother and his vineyards yearly at harvest time, and inevitably at least a few paintings will come out of it. 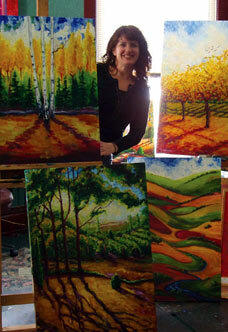 In her studio on Cedar Street, Lisa VanDerKarr poses with some examples of her artwork. Her images are as much a result of her outside surroundings as they are from her outlook. “I really believe in the power of thought. We are what we think, and we can create our own realities,” she said. If it’s true that positive thought significantly changes reality, then the happiness and hope that VanDerKarr’s art inspires is surely doing its part to make the world a better place. Her inspiration from the natural beauty of her surroundings is abundantly evident and continues to move her brush along each canvas. As long as she is living in Sandpoint, her muse will be by her side, drawing ideas from every yard, garden, lake view, hillside and forest she encounters. Her relaxed attitude and love for life show up in each painting, and the result is a piece of art that evokes just that in its viewer. What a treat. 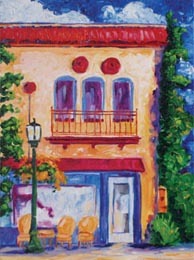 A snippet of First Avenue, “FC Weskil’s” is based on a familiar downtown landmark, the bistro next to the Panida Theater. 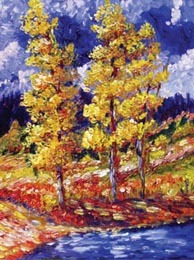 “Fall Trees” displays the vivid colors of fall foliage alongside water.